We firmly believe that Thanksgiving preparation begins with the table. We are all about presentation and, only when this task is done, can we move to the food. The foundation or theme must be set, and for us, it starts where we break bread. This doesn’t require expensive china and custom-ordered flowers (which, don’t get me wrong are nice too) but instead we’re drawn to bringing together the elements we already have that make a space warm, inviting, and from the heart. Here are our favorite modern thanksgiving table settings. 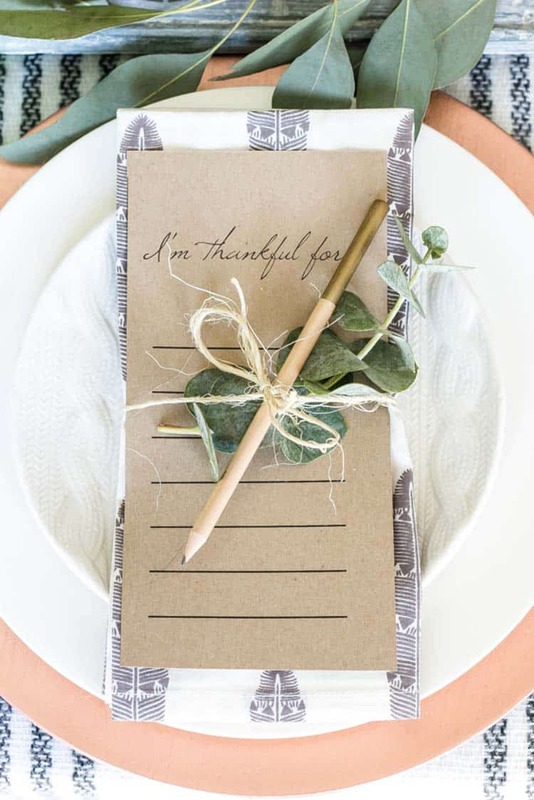 We love the simplicity of using fresh herbs as garland, incorporating a small DIY project (perhaps even soliciting fellow family members to participate), to even using a “What I am thankful for” list as a place-card. We can’t think of a better way to begin or end the day. Happy Thanksgiving everyone! A simple wood cutting board is transformed into a rustic and elegant charger with a personalized geode name plate. We are big fans of Camille Styles and love how she shows that a moss table runner adds depth and warmth to a holiday table. A cinnamon stick is used to prop up a place card. Black and gold, with a touch of green transforms a table into a elegant and timeless table. Tired of traditional? Be inspired and add a pop of color. This bright and cheery table setting would make anyone smile. A peaceful color scheme of matte blue, black, white and gold combined with earthy elements of herbs tied in twine. Looking for an incredibly simple way to upgrade your table? Try using butcher’s twine, rosemary and cinnamon sticks wrapped in your favorite linens. A pretty dish towel with freshly tied herbs turns a place setting from basic to farmhouse chic. Rosemary clusters are used as garland here to create casual elegance with minimal effort. Again, bringing the rustic elements indoors. These carved wooden chips make for a perfect nameplate for your Thanksgiving guest. We love how this table setting allows us all to remember what is important.